My baby girl is supposed to come out and play with us any day now. If you ask my wife, she was supposed to come a couple of weeks ago. We can’t wait to meet her! The “baby gear accumulation phase” has been in high gear since this is baby #1 for us. This means we have been attempting to acquire everything from cribs, strollers, and car seats to onesies, leg warmers (seriously) and cloth diapers. Trust me – the list is almost infinite. So how have I avoided becoming destitute before my baby even comes? Shopping yard sales. I’ve found some killer stuff at our neighborhood yard sales. 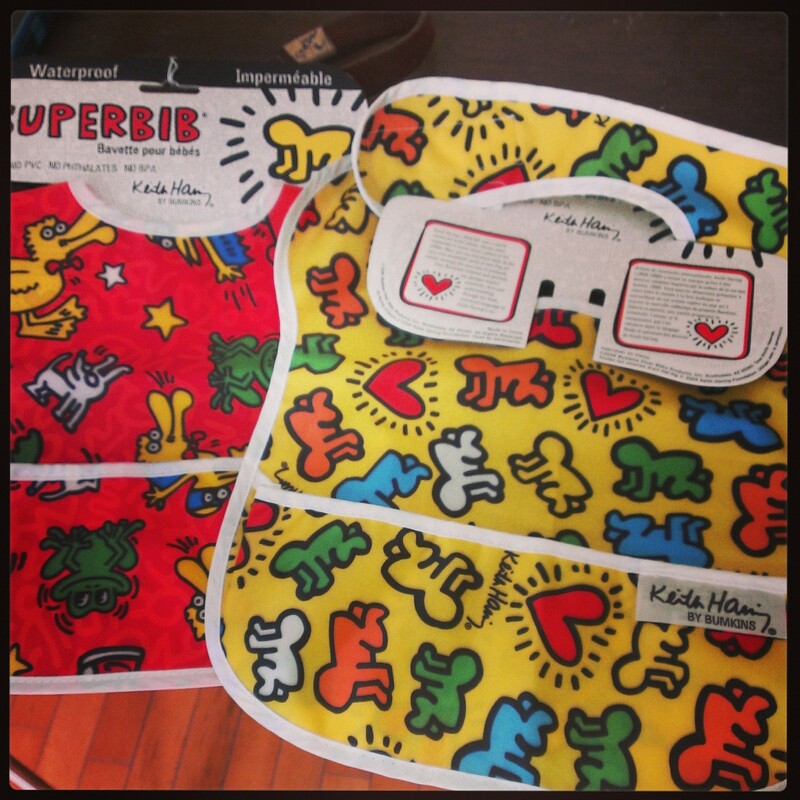 A $4 Baby Bjorn baby carrier was probably my best find – plus some $1 never been used crazy artistic bibs. My personal fave. Stores that sell used baby items are cool but yard sale prices are impossible to beat. Plus, the negotiating is fun! Using Craigslist. This can be a bit controversial, remember? Craigslist really is a great option for a lot of baby gear. I’m planning on using it to it’s fullest potential in the future. Finding free stuff. It’s amazing what people throw away! One man’s trash is truly another man’s treasure. I found a gently used Bumbo baby seat on the way to my favorite bar a few weeks ago. Random but true – and awesome. My buddy’s neighbor was putting out a brand new jogging stroller that she had never used. He actually turned around and sold it to buy a used model that they really wanted. Hah. It truly is crazy the things you can find for free if you keep your eyes peeled. Ask your friends. Many friends and relatives will happily give you their used baby items. One of my wife’s co-workers gave us his old baby carrier backpack, a bike carrier attachment, and another straight up baby carrier. If I had purchased those things new I would have dropped at least a few hundred bucks. I’m very thankful for friends and family that lend or give us gently used items. Don’t be afraid to tell your peeps on Facebook what you are looking for. This could set off a trigger in the brain of a friend about something they have in the back of their closet that they’ve been meaning to do something with. We are also really fortunate to have friends that threw great baby showers for us. All I can say about that is that we are lucky people to have such great friends and family. So if someone wants to throw you a baby shower, let them. Borrow a few things. Some items you’ll only need for a limited time – at least that’s what I hear, I’m not officially a dad yet! We’ve borrowed a few newborn accessories from some of our friends that could part with them for a limited time. Remember, it’s always nice to pay it forward and do the same for others. Cloth diapering. This is one of those things that doesn’t save you money up front. You pay a hefty amount for each diaper but you spend less in the long run. Cloth diapering has come a long way from a white cloth and a pin. Check out this post from View Along the Way on how to develop a great system for cloth diapering. It’s very thorough. And don’t forget that an HE washer will pay for itself incredibly quickly if you jump on the cloth diapering bandwagon. These are just a few of the ways I’ve been able to trim the baby budget. Many new parents feel the pressure to purchase all new gear for their bundle of joy. Try to avoid that trap by testing out these money saving options. What other ways have you saved on gear for your little one? If you could do it over, are there ways you would have tried to save more?